How many of us have any idea what a magnetic amplifier is or how they work? Very few, I would guess. Magnetic amplifier have been around since the beginning of the 20th century and have been used extensively in heavy industrial and military equipment controls. Their appearance is very similar to a typical electrical transformer, but the function is completely different. Basically, the magnetic amplifier is a current-controlled impedance changer. The current applied to the primary winding controls the degree of saturation in the secondary, which in turn causes the impedance of the secondary to vary. That action makes it functions like an electrically controlled rheostat. The atomic submarine Triton glides swiftly and silently through the deep. As its power plant purrs steadily, scores of electronic watchdogs probe every part of the sub's powerful reactor. Suddenly the pressure in a reaction chamber begins to rise over the allowable amount. 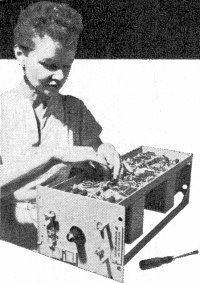 One of the electronic guardians instantly notes the rise and applies a corrective signal - before a human operator could know that anything had begun to go wrong. The electronic watchdogs that keep the Triton's powerful nuclear plant operating without a hitch are magnetic amplifiers - almost a hundred of them are used for this critical job. Yet these same magnetic amplifiers - the heart of the control system of one of the world's most up-to-the-minute fighting machines-are straight out of the horse-and-buggy era. Scores of magnetic amplifiers in the world-circling Triton control its atomic reactor. Above, finishing touches are put on the General Electric "magnetic" that monitors the reactor's temperature. Forgotten and Rediscovered. 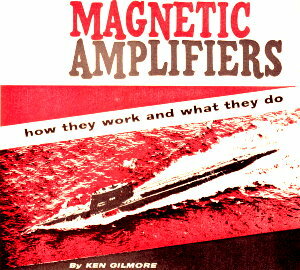 Magnetic amplifiers came into being when the century was just one year old. It would be six years - in 1907 - before a youngster named Lee de Forest would make news with his audion, the world's first vacuum-tube amplifier. And the transistor was still 47 years in the future. For a while, it looked as though the magnetic amplifier would hold its own against that upstart, the audion. In 1916, E. F. W. Alexanderson, the electronic pioneer, employed magnetic amplifiers to modulate his early transmitters and many World War I transmitting stations used his circuits. By the early 20's, however, the flashy vacuum tube had taken over, and the "magnetic" was almost forgotten in this country. 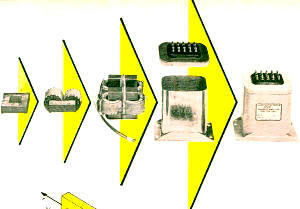 Stages in the assembly of a magnetic amplifier. Its similarity to a transformer in construction technique and general appearance is striking. It was not forgotten in Germany, however, as we found out when World War II started. In the years between the wars, the Germans had brought the magnetic amplifier to a high state of development. War-time found them using magnetics for reliable, accurate, and trouble-free control of everything from gun turrets to automatic pilot systems, and they even used them in the V2 rockets. Awakened to the possibilities inherent in this design, Allied scientists began to push the development of magnetic amplifiers. Before much progress had been made, though, the war was over. But the spark had been kindled, and a few years later Vickers Inc. (now a division of Sperry Rand) came out with the first commercially produced magnetics. By that time, interest had been aroused all over the world. In the following decade, hundreds of other firms, including all the big names in electrical and electronic equipment, have added magnetics to their product lines. And almost no branch of industry now operates without them. Flux Controls Current. A modern-day magnetic amplifier is, essentially, nothing more than an iron core with two or more coils of wire wound around it. In construction and appearance, it is similar to a transformer. But there the similarity ends. A magnetic amplifier - or saturable reactor, as it is sometimes called - is a true amplifier. Like a vacuum tube, it uses a small signal to control a large one. But there are sharp differences. Where the vacuum tube controls a current flowing to a d.c. power supply, the magnetic amplifier controls an a.c. flow. While the vacuum tube is primarily a voltage amplifier, the magnetic is a power amplifier. And where the vacuum tube uses voltage variations to control a flow of electrons, the magnetic amplifier controls current flow through a coil by varying magnetic flux. Fig. 1. Basic circuit for half-wave magnetic amplifier. 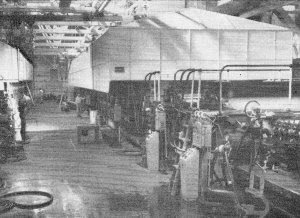 Thanks to magnetic amplifiers, this paper-making machine at West Tacoma Newsprint Corporation in Tacoma, Washington, can operate at 5000 feet per second, many times faster than previously possible. Magnetics continuously adjust the speed of the take-up rollers, slowing them down as the roll of paper gets larger. Magnetics come in half-wave and full-wave types, as do a.c. power supplies. First, let's look at the basic half-wave circuit shown in Fig. 1. A d.c. current flowing through the control winding will cause a build-up of magnetic flux in the iron core. The greater the flux, the lower will be the impedance of the output winding. With a lower impedance in the circuit, more current will flow from the a.c. power supply through the output winding and the load. When the current in the control winding reaches a certain point, the core is said to be saturated, which means that it has all the flux it can hold. At this point, the impedance of the output winding is very low, and the current through the load is very high. On the other hand, when there is no control current flowing, and consequently no flux in the core, the output impedance is extremely high, and practically no current flows through the output winding or the load. Thus, by controlling the current through the control winding, the output winding impedance, and consequently the current through the load, is made continuously variable. A rectifier in series with the output winding keeps the constantly reversing polarity of the a.c. supply from cancelling out the control winding flux. The direction of the current flow through the secondary is arranged so that the magnetic fluxes created by the two windings reinforce each other rather than cancel each other out. Fig. 2. Basic circuit for a full-wave magnetic amplifier. A full-wave circuit is shown in Fig. 2. It works like the circuit in Fig. 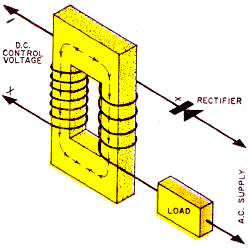 1, except that it makes use of both half cycles of the a.c. supply current. The two halves of the output winding are wound so that the direction of the magnetic flux created by both of them in the center leg of the core is the same as the direction of the flux created by the control winding. The bias winding can be used to control the general range of the amplifier's operation, just as the bias on a vacuum tube causes the tube to operate on a certain part of its characteristic curve. In a magnetic amplifier, when a small bias current flows, a certain amount of flux is continuously present in the core, even with no control voltage supplied. Thus, the impedance of the output winding will never reach its maximum value, nor will the current through the load reach its minimum. Many magnetic amplifiers have an additional control winding which is used for feedback. This winding taps a certain amount of the output circuit's current and applies it back as a control current. As with a vacuum tube, the feedback can be either negative or positive. In general, negative feedback improves the linearity of the amplifier while positive feedback increases its gain. Single-stage magnetics can be built with gains of about 200,000, far beyond the capabilities of the vacuum tube. With a gain on this order, a few milliwatts or power in the control winding - an amount that could be supplied by one or two flashlight cells - may control a load of 25,000 watts in the output circuit. Rugged and Reliable. Magnetics are extremely rugged. They can be - and frequently are - completely potted and sealed in airtight containers. They thrive on extremes of heat, dust, moisture, vibration, and other adverse conditions that would put vacuum tubes and transistors out of operation. Their efficiency is high, as with transformers and other magnetic devices. In addition, no filament current is required. So little heat is generated by magnetics that they can be packed into extremely small containers which need practically no ventilation or cooling. Because magnetics can handle large amounts of current easily, they are a natural choice for electric furnace control. 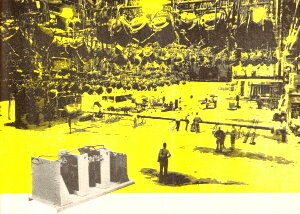 A Reynolds Aluminum Company furnace in Corpus Christi, Texas, uses such a control system. Precise furnace control by magnetics also helps to "grow" transistors in the latest types of transistor-manufacturing processes. Magnetics have recently begun to invade the field of entertainment, too. NBC's two big color television studies - one in Burbank, California, the other in Brooklyn, N. Y. - have magnetic amplifier lighting-control systems. With this setup, the lighting man has fingertip control over each of the hundreds of lights throughout the studio. He can control them individually or in banks, as he desires, working from a small keyboard that looks something like an organ console. Unlike older types of theatre lighting devices - autotransformers and rheostats-magnetics present no fire hazard. Since magnetic amplifiers have no moving parts and no delicate components, they last for years with virtually no maintenance. For this reason, they are used in such critical applications as the control of the atomic pile in nuclear subs and in missile-guidance systems, where reliability under adverse conditions of vibration, heat, and acceleration is vital. Reliability is also the reason magnetics were chosen to monitor and control the critical voltages and currents of the transatlantic cable. If a voltage begins to change, a magnetic compensates for the change, and, at the same time, sounds an alarm so an operator can check to find the reason for the change. 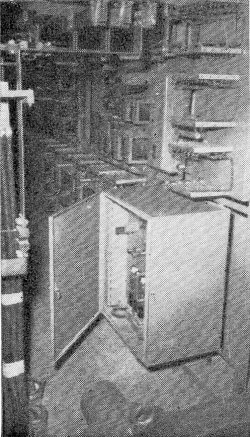 If the current drawn by the underwater repeater amplifier tubes begins to rise, once again the alarm is given, and corrective action is taken automatically. By insuring that the current does not rise to dangerous levels, the magnetics prolong the lives of the submerged tubes. This is important because lifting the cable to replace a damaged tube costs thousands of dollars. Long-Life Switching. Basic magnetic amplifier circuits can be modified to give special effects. For example, a magnetic to which excessive positive feedback has been applied becomes "bistable." This means that it is stable in only two states of operation: maximum output or minimum output. There is no in-between. The amplifier is adjusted so that the core is normally in a non-saturated state. But even the tiniest input signal - perhaps only a few microamperes - will throw it into complete saturation. Thus it becomes the equivalent of an extremely sensitive switch, or relay. But a magnetic amplifier is a switch without moving parts or contacts, and it is virtually indestructible. The bistable magnetic is beginning to find widespread use as a replacement for relays where long, reliable service is of great importance. Several automotive companies - the Ford Motor Co., for example - are now using magnetics to control the flow of parts in the engine assembly line. First, proximity switches containing magnetic amplifiers sense the presence or absence of necessary parts on an automated line. Other magnetics, cued by the proximity switch, supply the parts as needed. Since there are no moving components and no contacts, these magnetics show no signs of wear after millions upon millions of operations - long after normal relay contacts would have worn out. Another series of magnetics controls the speed of the engine assembly conveyor, to determine the proper production rate. The uses for magnetic amplifiers are almost limitless. 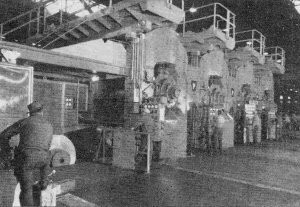 They serve as memory units in computers and as speed regulators in steel, paper, and textile mills; they control gun turrets and radar antennas on navy ships; they regulate the voltage output of huge turbine generators; they control automatic elevators, mine hoists, power shovels, cranes, and printing presses. 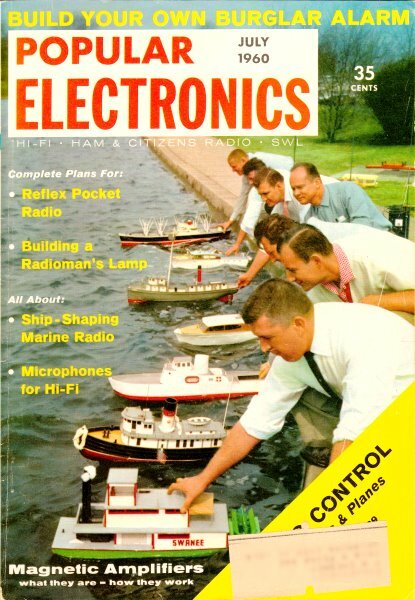 In short, wherever the considerations of precise, reliable, trouble-free control are important - from jet aircraft to atomic submarines - you'll find magnetic amplifiers working silently and efficiently.